While we await an announcement from Lionsgate on the upcoming Mockingjay - Part 2 home media release, we have a couple awesome tidbits that have been trickling out these past few days. You can pre-order the 4K+Blu-ray+Digital HD combo pack now from Amazon Canada - and we expect pre-orders for the U.S. to go live soon too. The disc should be region-free unlike the other U.S./Canada Blu-ray releases, but do beware of shipping costs. You will require a 4K TV and a 4K Blu-ray player, the first of which, from Samsung, has become available for pre-order just a few days ago, with other players coming soon too. There has been no news on whether the 4K Blu-ray will be released outside the U.S./Canada. And secondly, as reported last week, we have the first information on the special features for the Mockingjay - Part 2 home media release. The BBFC have classified the audio commentary with director Francis Lawrence and producer Nina Jacobson, we expect this to feature on all release formats. Hopefully we'll get more info on deleted scenes and behind the scenes documentary (which, per IMDB, is titled Pawns No More: Making The Hunger Games: Mockingjay - Part 2) soon! 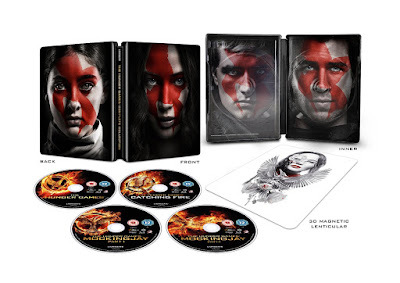 UPDATE: UK Tributes - check out the full packaging for the Amazon UK exclusive 4-film The Hunger Games - Complete Collection steelbook set! The set also features an exclusive lenticular version of the Mockingjay - Part 2 IMAX poster. Pre-order it now. The Hunger Games: Mockingjay - Part 2 will be released on 4K Ultra HD Blu-ray, Blu-ray, DVD and Digital HD this spring.